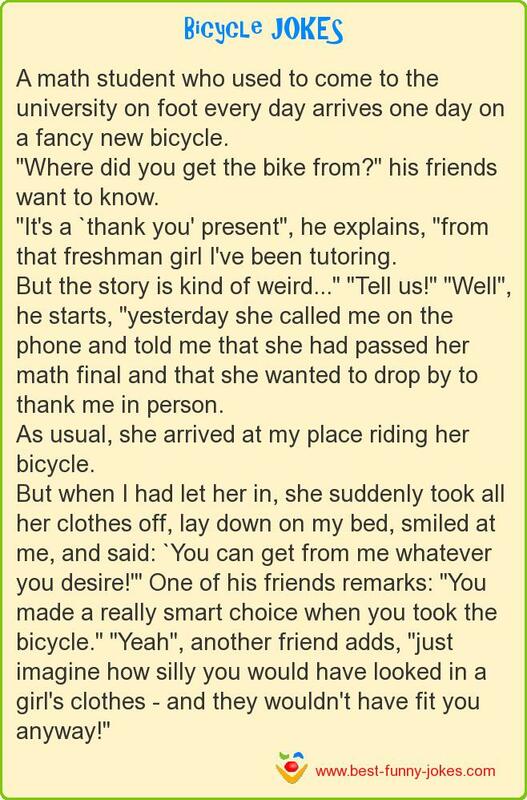 A math student who used to come to the university on foot every day arrives one day on a fancy new bicycle. "Where did you get the bike from?" his friends want to know. "It's a `thank you' present", he explains, "from that freshman girl I've been tutoring. But the story is kind of weird..." "Tell us!" "Well", he starts, "yesterday she called me on the phone and told me that she had passed her math final and that she wanted to drop by to thank me in person. As usual, she arrived at my place riding her bicycle. But when I had let her in, she suddenly took all her clothes off, lay down on my bed, smiled at me, and said: `You can get from me whatever you desire!'" One of his friends remarks: "You made a really smart choice when you took the bicycle." "Yeah", another friend adds, "just imagine how silly you would have looked in a girl's clothes - and they wouldn't have fit you anyway!"